Note: This works on only one email account per Outloook. If you have multiple accounts, I am working on a version to manage those. Please drop me an email if interested. 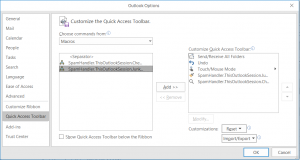 Enable Visual Basic in Outlook (if not already enabled): File – Options – Customize Ribbon then set check box for Visual Basic. Copy in the code: Open Visual Basic editor (Devloper – Visual Basic). Copy the attached text in SpamFilter attached above into ThisOutlookSession. Compile and save the macros: Select Debug – Compile and then File – Save menu options. Close Visual Basic editor. Assign the new macros to Quick Access toolbar: File – Options – Quick Access Toolbar. Select ‘Macros’ from drop-down list and then Add Junk_Item, TestMailItem and CheckForSpam macros. You can modify here the icons displayed in the Quick Access Toolbar if you wish. BlockedSenders uses native Outlook functionality, which identifies email from a list of addresses as Spam and moves these to your Junk folder. You may use our list as a starting point. Click on the link above, and select Save As … then save BlockedSenders.txt to any folder (C:\Users\youruserid\Downloads for example). From Home tab, open Junk – Junk E-Mail Options – Blocked Senders – Import from File and then select BlockedSenders.txt from the folder you saved it into in the step above. You can now delete the BlockedSenders.txt file (or keep for reference). Windows maintains a local mapping of IP addresses (hosts) for certain websites. You can use this to blacklist unwanted spam/dangerous sites . This removes some pop-up ads, and prevents some other unwanted activity. This should reduce data usage and speed up access times for some websites that reference external material on your blacklist. Note: there is no 100% solution to manage ad-noise, this is simply one possible layer in your armour! Click on the link above, and select Open. Select all contents (Ctrl-A) and then copy (Ctrl-C). Find Notepad or Notepad++ in your applications, right-click to bring up context menu and select Run as administrator (might be under More>). Click File – Open and navigate to C:\Windows\System32\drivers\etc (make sure you’ve selected All Files *. * and not Text Files *.txt) and then open hosts file. Paste the previously copied text into your hosts file (Ctrl-C) …. you may replace the entire contents with this new list (Ctrl-A then Ctrl-C). Now save (File – Save). We will provide regular updates to all of these (the SpamFilter macro, BlockedSenders and hosts file) if there is demand. Please email me at admin@qsol.co.uk if you would like a regular update. If you have your own list of BlockedSenders or blocked hosts, please email those to us at admin@qsol.co.uk and we will amalgamate into the next update … that way we can all help each other to de-spam our lives!